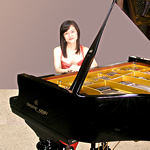 Pianist Ms. Junko Ueno Garrett will visit the three countries to give concert-lectures to local audiences and music students. She will be comparing and contrasting Japanese music with Western music in style, expression and melody through a survey of Japanese music history. This program is co-organized with Embassy of Japan in Cuba, El Salvador and The Japan Foundation, Mexico.